As online slot games become more and more numerous, a few things are changing. First of all, in order to get traffic and buzz, game developers have had to increase the winnable ratios of their games, making virtual slot machines with higher payout percentages. Secondly, theme and atmosphere are becoming more and more important. While the basic gameplay of slot machines is always more or less the same—spin the pay lines and hope for a win—developers are becoming more creative in creating unique gameplay experiences. 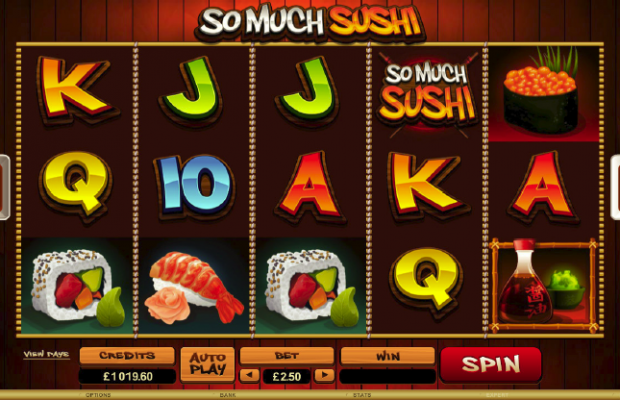 One of Microgaming’s newest slots, called So Much Sushi, exemplifies both of these trends. On one hand, the machine is incredibly accessible, with high payout percentages and plenty of ways to multiply your winnings and boost your jackpot. It truly is a great slot machine to play for those who don’t want to risk too many losses. However, perhaps what makes So Much Sushi so much fun is that the game creates an exotic and engrossing gambling experience that is completely its own. We’ve seen plenty of slot games based on popular movies or TV shows, but how many have played on our love for food? Make no mistake: So Much Sushi will make you hungry. Flowing graphics and animated sushi pieces—from spicy salmon to shrimp tempura—are enough to make you want to cut your game short and head to your local all-you-can-eat sushi restaurant for an authentic Asian feast. Add soothing Asian-inspired music, a cool bamboo background and even a digitalised bottle of soy sauce (and a bowl of wasabi, of course), and this game will transport you to another place. Atmosphere is the most winning aspect of So Much Sushi. When you land three pieces of sushi on your page, you get a chance to multiply them and win free spins, but watching one sushi piece burst into five others is nearly as exciting as watching your payout grow. Ultimately, So Much Sushi passes the test of a great slot game, in that it would be fun to play even without money at stake. Just make sure you have the number for a nearby sushi restaurant handy as you play, in case you need to place an order for takeout.